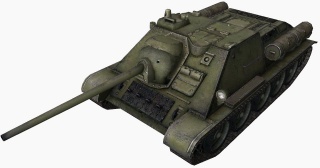 The SU-85 is a Soviet tier 5 tank destroyer. With a covered top, the SU-85 has much better survivability against HE damage than its predecessor, the SU-85B. Despite this, the weak armor and low HP of the SU-85 requires it to cling to its stealth in order to survive; one should avoid direct confrontation as long as possible. With decent accuracy, modest penetration, and respectable damage, the gun of choice for many players is the 85mm D5S-85BM. Worth noting is another possible weapon, the 122 mm M-30S, which can be devastating at close range with HEAT ammunition, and possibly HE in 8.6, although one must make sure to be fully aimed and not too far away, due to the extreme inaccuracy. Whichever weapon you choose, be extremely cautious of taking return fire. 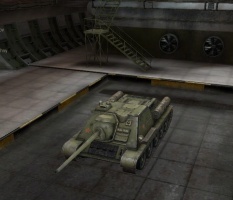 The SU-85 leads to the SU-100. While it has low survivability, the SU-85's terrific camouflage values allow it to stay hidden at even close ranges. However, it is unable to engage targets at range without help; the horrible view range requires allied tanks to spot for you. Whilst not immediately evident, in actuality the 85mm D5S-85BM has respectable alpha damage, which can strip HP away from its peers at an alarming rate. It is important not to overlook the great top speed the SU-85 offers. In many situations it can be a better asset than the StuG III's agility. You can get across the map very fast, allowing you to escape dangerous situations or get into position faster than most vehicles you will come across. Note that the 122 mm howitzer is only used by the SU-85. Unless you want to elite the SU-85 (or you want to use it), you can skip it entirely. The SU-85 was a Soviet self-propelled gun used during World War II, based on the chassis of the T-34 medium tank. 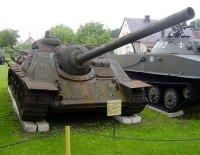 Earlier Soviet self-propelled guns were meant to serve as either assault guns, such as the SU-122, or as mobile anti-tank weapons: the SU-85 fell into the latter category. The designation SU-85 is derived as follows: 'SU' stands for the Russian: Samokhodnaya Ustanovka - self-propelled carriage, while "85" signifies the bore of the vehicle's armament, the 85 mm D-5T gun. Early in World War II, Soviet tanks such as the T-34 and KV-1 had enough firepower to destroy any German tank then available. However, in the fall of 1942, Soviet forces encountered the new German Tiger tank, with armor too thick to be penetrated by the 76.2 mm guns used in the T-34 and KV tanks at a safe range. 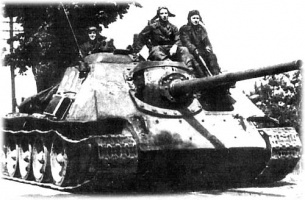 By spring 1943, the Soviets had also received reports of the new Panther tank, although the Panther was not seen in combat until July 1943, during the battle of Kursk. 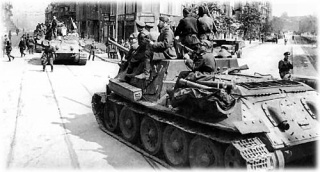 This new generation of German vehicles meant the Red Army needed a new and more powerful tank destroyer. 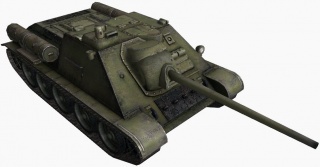 In May 1943, work was begun on both a new anti-tank gun and a redesign to the armament of the SU-122. 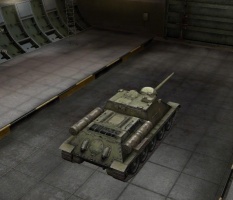 Developers of the former put their efforts towards adapting the 85 mm heavy anti-aircraft gun, one of two types identified as best against the Tiger (the other being the 122 mm A-19). 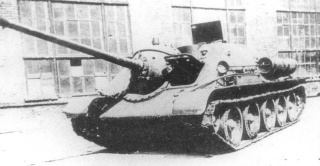 The SU-122, meanwhile, was rearmed with an existing 85 mm gun, the S-18, which was itself improved in the process. The production factory at Uralmash, which received the SU-122 design, attempted to reject the design as too expensive, since the larger gun breech meant that the entire hull would need to be modified, but it was required nevertheless to put the design into production. 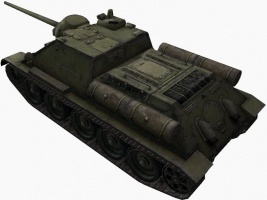 Of the SU-85, several prototypes were rejected for design flaws, but after several changes, which included changing the gun to a D-5T, one was put into service as the SU-85. At the same time, the 85mm D-5S, which had proven both effective and reliable, was modified to include a telescopic sight and a new ball mantlet design and retitled the SU-85-II. 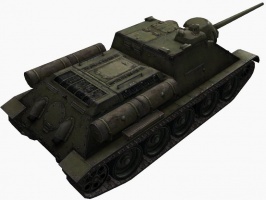 The SU-85 was a modification of the earlier SU-122 self-propelled howitzer, essentially replacing the 122 mm M-30S howitzer of the SU-122 with a D-5T high-velocity 85 mm antitank gun. The 85 mm gun was effective against Panther and Tiger tanks at long range. The vehicle was small, highly mobile, and well armored. 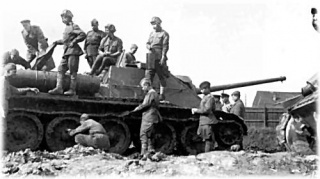 SU-85 production started in mid-1943, with the first vehicles reaching their units by August. 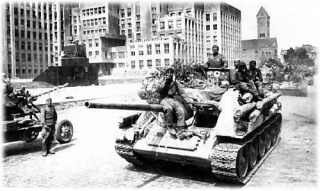 When the up-gunned T-34-85 medium tank entered mass production in the spring of 1944, there was no point in continuing production of a tank destroyer without superior firepower, so SU-85 production was stopped in late 1944 after 2,050 vehicles had been produced. 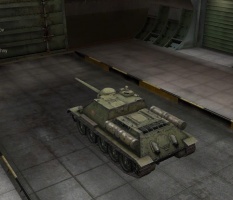 It was replaced on the production lines by the SU-100 tank destroyer, armed with the more powerful 100 mm D-10S gun. There were two versions: the basic SU-85 had a fixed commander's cupola with a rotating periscope and three vision blocks; the improved SU-85M had the same casemate as the SU-100, with a commander's cupola as used on the T-34-85. SU-85 tank destroyer of the Polish 13th Self-Propelled Artillery Regiment. This vehicle is missing its right first road wheel and its front fenders. The SU-85 entered combat in August 1943. It saw active service in Soviet, Polish, and Czechoslovak forces on the Eastern Front until the end of the war. It was obsolete by 1945, and was withdrawn from active service not long after the war to be exported to many Soviet client states in Europe and elsewhere. The SU-85 remained in service longer in North Korea and Vietnam. The similar SU-100 remained in service much longer, and some SU-85 and SU-100 were converted and used as command and recovery vehicles. 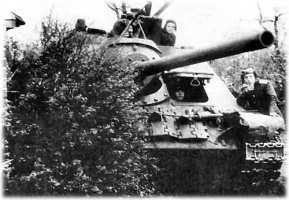 SU-85 - Main production model armed with 85 mm D-5T gun. SU-85BM - An SU-85 with an improved 85mm gun, the D5S-85BM. The muzzle velocity of the gun was increased to 900 m/s, leading to 20 percent increase in penetration. The barrel was 1068mm longer than the one of the original D-5S and to compensate for this, the trunnions were pushed back by 80 milimeters. 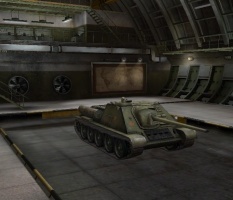 The prototype vehicle (the implementation of this gun into the SU-85) was made by the Uralmash plant in January 1944. It was tested at Gorokhovets proving ground between March and April 1944. 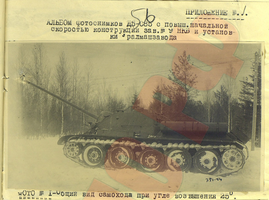 It passed the tests, but was never accepted in service because of the appearance of the SU-100 project. SU-85M - SU-85 with the casemate from the SU-100 tank destroyer, which was larger and could carry up to 60 rounds instead of 48. 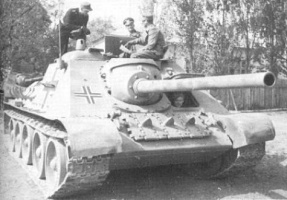 It also had the same commander's cupola as the one used in the T-34-85. SU-85T - SU-85 converted into an ARV. SU-85-III - Fourth SU-85 prototype with a modified commander's cupola, with direct vision slots and covers. WPT-34 (1960s) - Polish repair and maintenance vehicle with a superstructure replacing the casemate, a crane, a large-diameter telescoping snorkel for deep fording operations, as well as a large-spade type earth anchor in the rear. 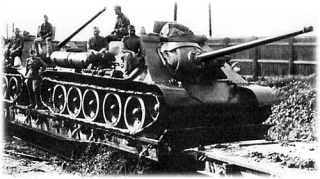 It was converted from SU-85 tank destroyers as well as T-34 medium tanks and SU-100 tank destroyers. SU-85 tank destroyer of the Polish 13th Self-Propelled Artillery Regiment. SU-85 during delivery to the crews at the production plant. a b c d e f g "The Russian Battlefield"
This page was last modified on 27 January 2017, at 04:01. This page has been accessed 407,229 times.